Every football club launches a season ticket renewal campaign. No club other than Rangers is likely to find it such a fraught process. Price rises, ranging from between 15% to 25%, were inevitable and had been indicated at the annual general meeting of shareholders last December. For fans, though, the decision on whether or not to renew is complicated by the club's state of affairs. Even the timeframe has drawn attention, since the renewal deadline is 6 May, less than four weeks away. In the context of the discontent that has gathered around Ibrox, the sense is of supporters being given little time to make their choice. There is always an emotional element to the commitment, but Rangers fans have generally become more wary, even before the prospect of the Union of Fans - a coalition of supporters groups - opening a trust fund as an alternative for supporters who don't want to renew under the current circumstances. In meetings last month with the former director Dave King, who wants to invest in the club, the Ibrox board had agreed to complete the business review being undertaken by chief executive Graham Wallace before the season ticket renewal process. King will consider the launch as a breach of that agreement and is likely to respond firmly. The results of Wallace's review, and subsequent funding plan, will determine how Rangers approach the attempt to gain promotion from the Championship next season. They will also go some way to determining King's approach. He wants to provide funds to invest in the team and the football infrastructure now, to enable Rangers to return and then immediately compete in the top flight. In his view, this should be done through the issuing of new shares, which could grant him overall control. The board agreed to similar sporting aims, but do not have the money to finance it since the cash reserves have run out. Wallace needs to cut around £3m from the current running costs, and increase the revenue streams, just to bring the business to an even keel, but the season ticket money is also required just to keep the business going. This is the backdrop to the renewal campaign, which is symbolic of the lack of unity that abounds. Wallace announced at the AGM that his business review would take 120 days, which ends on Thursday 17 April, yet in the notes accompanying the interim results last month he indicated that it might be the end of April before the review and report to the board are completed. The business's going concern status was also only signed off on the basis of the price rise and a modest uplift in renewals. 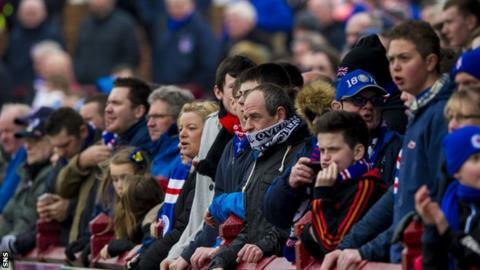 Despite Rangers embarking on their bid for promotion back to the Premiership, in a second tier that will contain Hearts but also possibly other leading clubs, it seems a stretch to believe that more than 37,000 will sign up for season tickets. As well as uncertainty about what funding will be available, or if only cuts will be imposed on the squad, supporters have grown weary of the quality of football this season. The defeat by Raith Rovers in the Ramsdens Cup final drew a disdainful response, and there is still a Scottish Cup semi-final against a talented Dundee United side to address. Either through concern about the quality of the football, frustration with the board and the direction of the club, or just a doubt about the club's financial stability when £1.5m in loans had to be sought from two shareholders last February and both Ibrox and Murray Park require maintenance work, the willingness to renew is being eroded. It has previously been a matter of faith, an indication of the supporters' ongoing commitment to their team. It is now a matter of judgement, of trust or otherwise. There is no incentive to renew immediately, and even missing the 6 May deadline would not be critical since there is no waiting list and supporters who hold off could still retain their seats. The alarm for the directors is a significant drop off in numbers, since this would drastically undermine their means to continue, and make it more difficult, perhaps even impossible, to hold off King. Rangers will receive the season ticket income up front, since a finance company will underwrite the options that allow fans to pay in instalments, a common arrangement in football. The first £1.5m raised, though, will be used to pay back the shareholder loans - from George Letham and Sandy Easdale, who is also a director on the football club board. The directors will watch the initial renewal numbers with concern, while some supporters will await the review, and others will wait to see what the general uptake is like. With the money raised from the initial public offering of shares in December 2012, and two tranches of season ticket money, having been spent, wariness is widespread. It is also political, since the future of Rangers - as it stands - would seem to either involve cost-cutting under the current powerbase of directors and a group of aligned shareholders, or King becoming the significant influence. Fans can buy tickets on a game-by-game basis. The season ticket uptake will reflect the mood for change or otherwise, but also go some way to determining Rangers' short-term future.